Inproving robustness of the L-BFGS for Large Scale Nonlinear Optimization. Abstract and Poster Submission – not later than December 31th, 2013. Registration Fee – Payments with discount until January, 15, 2014. Financial Support: The workshop has a limited number of grants to cover local expenses of students and young researchers. Applications must be submitted until February 17th, and the result will be released on February 27th. All applicants must register at the workshop’s homepage. 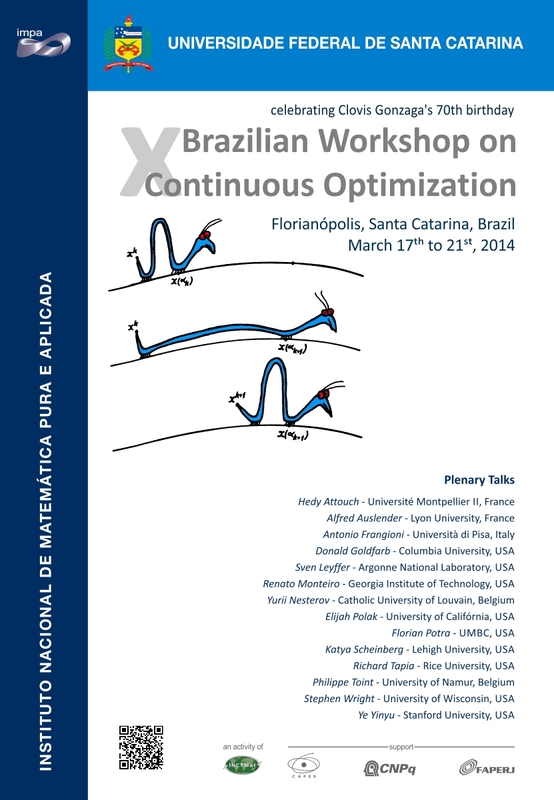 to eventos@impa.br or xbrazopt@gmail.com, with subject line “X BRAZOPT – support”. Financial support will be given just to students and Young researchers that will make a presentation during the workshop. Posters will have to be mounted between 08:00 and 08:30 in the morning and will have to be removed after 18:00 in the evening. During the poster viewing period the presenting author and/or co-authors are asked to be present at the poster in order to be available for questions and discussions. Pagamento da taxa de inscrição SOMENTE para brasileiros através de: transferência ou depósito identificado (nome do participante inscrito) ou o envio escaniado (e-mail: xbrazopt at gmail.com) do comprovante para ser lançado no registro do evento. The excursion price is R$ 80 per person, including lunch; and must be paid before 9am of Tuesday, March 18. For paying the fee and more information on departure and arrival times, please contact the workshop registration desk in the hotel.